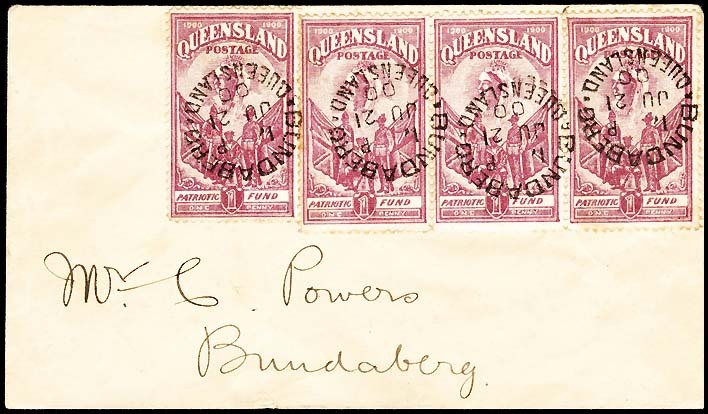 The 1900 Patriotic Fund issue of Queensland - 1d (6d) on cover. The lack of interest in the issue led to few covers being produced. The recorded covers were all philatelic. 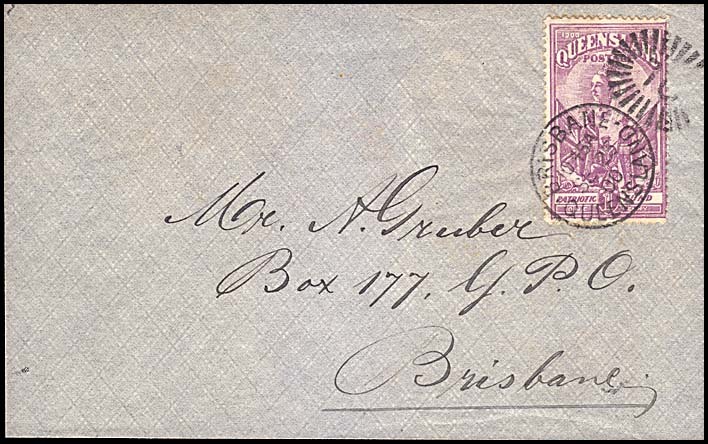 No recorded cover can really be classified as being a genuine postal use of either Queensland Charity stamp. 2d stamps are rarer than 1d stamps on cover. Most of the recorded covers do, however, come with singles of both stamps (such as for both the Gruber and Powers covers below). mixed frankings of both the Queensland 1900 Charity stamps with another issue. Five covers are recorded with a 1d single franking. Single 1d franking is paying the correct rate. Mossgreen Auctions June 2015 Lot 427. Warwick for local delivery. Single franking is paying the correct rate. George Street to Swan Hill, Brisbane. Addressed to Mr. W. M. Robinson - see combination frankings elsewhere. Provenance: Alan Griffiths. Spink October 2012, Lot 1395. Brisbane for local delivery. Millennium Auctions: April 2003 Lot 591, November 2003 Lot 805 ( both lots in conjunction with a 6d cover) and August 2004 Lot 115. Summary of recorded covers with a single franking of the 1d (6d) stamp. 21 June 1900 Brisbane. Brisbane. (Blue cover addressed to Mr. Gruber.) Matthew Bennett February 2003 Lot 571. April 2003 Lot 591, November 2003 Lot 805 ( both lots in conjunction with a 6d cover) and August 2004 Lot 115. 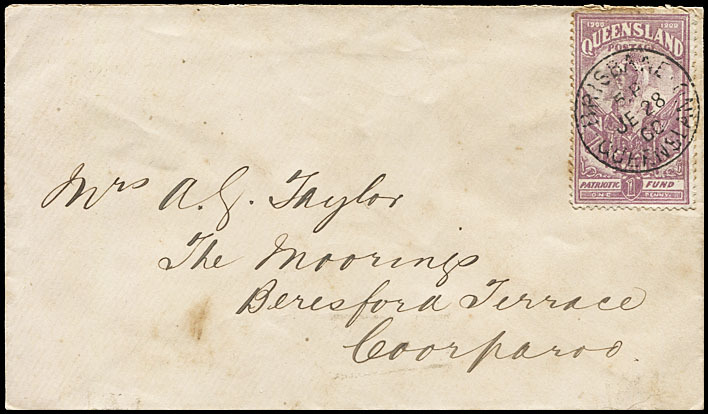 (addressed to Mrs. A. G. Taylor). Ebay. 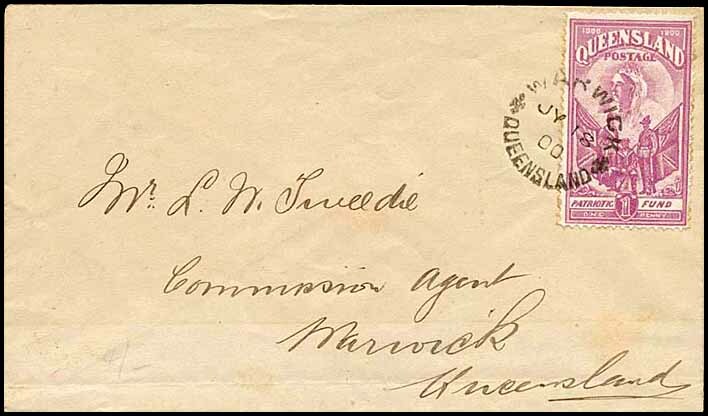 (addressed to Mr. L. W. Tweedie, Commission Agent). Mossgreen June 2015 Lot 427. 27 July 1900 George Street. (addressed to Mr W. M. Robinson, Stamp Dealer). Corinphila May 2018, Lot 3196. 25 September 1900 Brisbane. Brisbane. (Grey cover addressed to Mr. Gruber with QL in top right corner.) Spink October 2012 Lot 1395. Only two covers are recorded with a multiple franking of the 1d (1/-) stamp. Millennium Auctions April 2003 Lot 590. Bundaberg for local delivery. 4d franking - including a scarce strip of 3 - overpaying the 1d local letter rate. The largest recorded franking of the 1d Queensland Charity stamps. (Millennium Auctions April 2003 Lot 589, June 2004 Lot 75, November 2004 Lot 78, April 2005 Lot 165, August 2005 Lot 364). There is only one known cover with a 1d (6d) Charity stamp and stamps from a different issue. 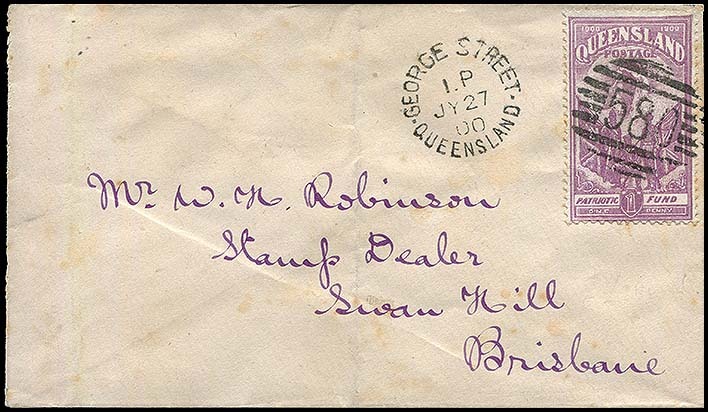 It was sent from Richmond to Winton on 27 July 1900 and has backstamps for Hughenden and Winton. In addition to the Charity stamp, it has a pair of 1d orange (Matthew Bennett February 2003 Lot 570). It also has a straight line Registered/Richmond.